Homer left the farm yesterday. In June. Amazing. He was there at our CSA distribution and other deliveries. 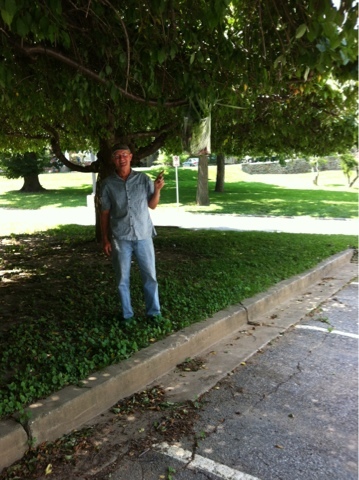 He found a spot in a tree to hang a bag of vegetables for one of our CSA members who was running late. And then we attended a meeting of people considering new options for housing. Some people there we have known forever, some we just met. As the conversation evolved, it became apparent that we are not the only ones considering a pretty strong shift in housing, while not paying hundreds of thousands of dollars to do so. Reassuring. We were there when our friends Lola and Stu burned their mortgage. They made a copy of the paperwork that breaks down how much a household pays for their living space, and when they had made the last payment (at an accelerated pace, paid off years before required date), Homer and I attended the burning and cheered them on. I've known other people who live mortgage/rent free. We do, and it is life changing. The next largest payment we make annually are our real estate taxes. And just behind that? Utilities. Oil to heat this house we don't love, built when oil was $.50 per barrel. We have visitors to the farm on a regular basis and we always talk about how to reduce costs of living, and about how people can have hope of home ownership that does not bankrupt them. How to have a sense of security that come what may, things will be well. We are there in many ways. Eventually knocking this house down and rebuilding is in our plan. Nice to have a couple more people interested in the same outcome to bounce ideas around with. And there was something I had never had. Watermelon juice. With crushed ice. Like a slushee drink, only much better. Just watermelon juice and ice. Amazing. Yum. Back to farming! Another hot day with no rain, everyone/thing needs plenty of water, no running out.